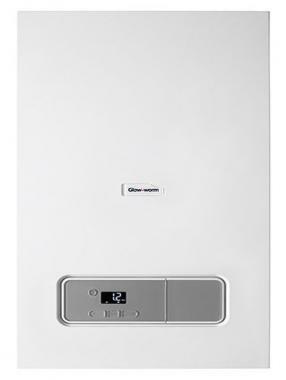 The Energy Combi 35kW from Glow-worm is a condensing and wall mounted gas boiler. As a combi boiler it will provide hot water and heating on demand directly from the mains water supply. This means you don't need to have a bulky tank in the attic or storage cylinder in the airing cupboard making it the perfect choice for those homes where space is limited. This boiler is a compact, all in one unit which is able to be installed in most places, including a kitchen cupboard so you can keep it out of sight and save valuable space. It has a contemporary design featuring a bright, easy to use interface and a wide choice of choice controls. This boiler has an option of rear flue which gives you even more flexibility when it comes to where in the home to install it. It is a highly efficient boiler with an efficiency rating of 89.2%. This means the unit is B rated which should help to keep running costs low, saving you money on your energy bills. This boiler has an output rating of 35kW making it ideal for properties with multiple bathrooms and a higher demand for heating and hot water. It is also available in 25kW and 30kW to suit homes with a lesser demand. You’ll receive a 7 year warranty with this boiler so you can be sure you are purchasing a highly reliable unit that isn't going to let you down.